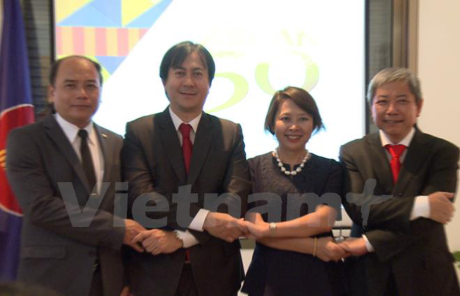 Hanoi (VNA) – The 50th anniversary of the Association of Southeast Asian Nations (ASEAN) was observed across the world on August 8 with the participation of diplomats from ASEAN member states. The Patousai Arch of Laos was lit up on August 8 to mark ASEAN’s 50th birthday and 20 years since the country joined the ten-member group, attracting 200 officials in charge of ASEAN affairs of Lao ministries and agencies and representatives of embassies in Laos, among others. This is part of the ASEAN Landmark Lighting event, an initiative of the Philippines - ASEAN Chair 2017 - aiming to raise public awareness of ASEAN. Major sites in ASEAN member countries were lit up red, blue and yellow or decorated with the bloc’s icon. Addressing the lighting ceremony, Minister to the Prime Minister’s Office Alounkeo Kittikhoun said ASEAN has focused on intensifying regional connectivity and building the ASEAN Community, which officially took shape on December 31, 2015. At the same time, ASEAN has stepped up ties with foreign countries and expanded dialogues with world powers through ASEAN-initiated mechanisms, helping enhance mutual understanding and strategic trust, and create peace, stability and cooperation, for the development of the region and the world, he said. The minister said over the past two decades, ASEAN has become an important pillar in Laos’ foreign policy, adding that the country has participated in ASEAN’s activities and expanded relations with nations outside the group, benefitting the country and its citizens. The same day, the Philippines Embassy in Israel held a ceremony to mark ASEAN’s founding anniversary. Vietnamese Ambassador Tran Quoc Hai and representatives from other embassies of ASEAN nations in Israel attended the event. The participants reviewed challenges ASEAN has faced over the past half a century to become a successful cooperation organisation. In his remarks, Philippine Ambassador Neal Imperial said ASEAN has made decisions via consensus to ensure all of its members have their voices heard. He stressed that the common perceptions reached by the members and their mutual understanding and trust have helped ASEAN overcome challenges and threats to its centrality. As ASEAN Chair, the Philippines, with the support of other ASEAN nations, has made every effort to boost the strength of the group, he said. Echoing Neal Imperial’s views, Ambassador Hai said intra-bloc solidarity and consensus are the key factors to maintaining peace and stability, and the foundations for ASEAN to build a prosperous, people-centred community. In Algeria, a ceremony was also held in the capital of Algiers with the ambassadors of Vietnam, Indonesia and Malaysia, and other guests in attendance. Speaking at the event, Vietnamese Ambassador Pham Quoc Tru highlighted ASEAN’s successes in enhancing cooperation between its members, as well as between ASEAN and partners outside the region, contributing to promoting regional peace and stability. ASEAN’s initiatives have contributed to enhancing connectivity between Southeast Asia and other regions, and brought new dynamism in inter-regional dialogues and cooperation, he said. On the occasion, participants had a chance to watch films about ASEAN countries and enjoy food from Vietnam, Indonesia and Malaysia. ASEAN’s birthday was also celebrated in Buenos Aires, Argentina, on August 8, with the ambassadors of Vietnam, Thailand, Indonesia, Malaysia and the Philippines attending. The event featured art performances and dishes from the five countries. A photo exhibition introducing the ASEAN Community and its diverse culture also opened at the headquarters of the Argentinean Ministry of Foreign Affairs. The ASEAN Committee in Cairo, Egypt also hosted a ceremony to mark ASEAN’s 50th anniversary, bringing together representatives from embassies of Singapore, Malaysia, Indonesia, Cambodia, Thailand, Brunei, the Philippines, Myanmar and Vietnam. Addressing the event, Vietnamese Ambassador Do Hoang Long noted the thriving relationship between Egypt and ASEAN, which has been demonstrated through visits to several ASEAN countries over the past years by Egyptian President Abdel Fattah El-Sisi. He said the Vietnamese Embassy will take over the rotating chair of the ASEAN committee in Cairo in 2018. ASEAN’s 50th birthday was cheered in a ceremony hosted by the embassy of Thailand in Bangladesh on August 8.